Start saving your toonies! TPV will be at Clinton’s Tavern (693 Bloor St. W, near Christie Station) on July 9 for the Meet the Presses chapbook market. Look for our travelling machine, lovingly known as Snacks, all stocked up with our new issue and possibly some back issues too. See you there? 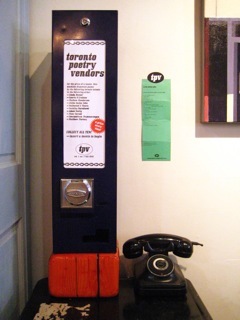 We can barely express how excited we are to have a TPV machine at Shopgirls gallery boutique in Parkdale. If you’ve been there, you know how fabulous it is, and if you haven’t, well, may we suggest you join us June 30 at 7 p.m. for the launch of the spring 2011 issue?